+ 850 sq feet 2 bedrooms, 2 baths, bonus loft. completely upgraded & is one of the nicest condos in the complex. + If using a NON-USA credit card a 2.5% additional international surcharge will be added and need to be paid prior to check in to complete reservation. This additional charge may be avoided by paying by e-check. PARK CITY July 5, 2017 -- Park City Condo Rentals LLC (DBA All Park City Rentals) has been selected for the 2017 Best of Park City Award in the Other Business Services category by the Park City Award Program. I am the owner/manager/janitor and everything in between of this home and 7 others here in Park City. I love to ski and enjoy the summer activities. Park City is the absolute best! This was the first condo I bought in town and it was the catalyst for me to spend as much time as possible in Park City. The town can't be beat and is a wonderful place to be any time of the year, I loved it here so much I accumulated more properties and started Park City Condo Rentals LLC (All Park City Rentals / Aparkcity). I have 8 properties all listed here and Aparkcity. Come to Aparkcity today and stay in one of my wonderful homes and have a vacation to create memories to last a lifetime. location location location! This was the first property I bought in Park City and was the catalyst for me to spend more and more time in this amazing city. The location was the key reason I bought this unit but also the fact that it was a 2 bedroom plus loft made it more appealing. I completely gutted and remodeled to make the condo a cozy, comfortable, and charming home that I would enjoy staying in at any time of the year. I am so excited that I am able to share this special condo with others to experience the magical town of Park City. 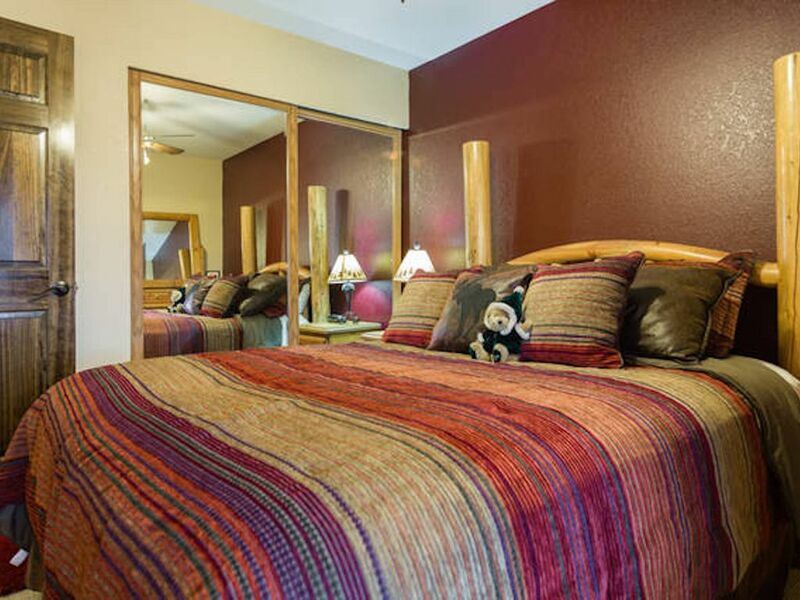 walk to 3 lifts at the base of Park City, Netflix, internet throughout, firewood provided, l'occitaine amenities, 100% cotton towels, fine linens, much more! Discounts on ski rentals and great airport transportation service recommendations. Bathroom 2 also has an HE washer/dryer. This bathroom is located en-suite in the upstairs bedroom. located right across from Park City Golf Course! Great views of Park City Mountain Resort right across the street! A car is NOT needed at this location. If you do decide that you must have a car on your vacation, ONE parking pass is provided for your stay to park in the Snowcrest lot. This unit is not suitable for wheelchairs of physical disabilities. The unit is located on the top floor of the complex (and has a spiral staircase in the unit) and there is not an elevator to access the unit. Please ask me about other rentals that are more suited for ease of access. Wood burning Fireplace, Cable LCD flat screen TV, DVD player and DVDs, Upgraded Linens provided, Warm Cozy upgraded mountain furnishings, Free wired and wireless internet access, No Pets please, Silver+ rated unit, Walk to Park City Chairlifts, On Free Shuttle Route, no monthly rentals in winter. Perfect condo for 4 guys or 3 couples. Easy walk across parking lot to the lifts. Cozy but not cramped and modern interior. Just the right amount of comfort without paying for extra fluff. Patti (the owner) is extremely helpful and available to answer any questions. Hope to stay here again! Great condo for our family of four. It was a easy walk across the street to the ski lift and s quick ride to Main Street. Thanks, Sandra, for your review and choosing my condo! glad you found it in a great location and it was great for your family. I hope you come back again in the near future . Great location, very accomodating host! This was a great choice for our group. Excellent location, easy walk to park city base. Patti was very accommodating considering our arrival and departure time. I will say that the upstairs bedroom I slept in was slightly cramped, but it was very convenient to have a bathroom plus washer/dryer up there! Great condo at the foot of the mountain. Had everything we needed. We were a small group attending Sundance and this was the perfect spot. It's excellently located and comfortable. EXCEEDS EXPECTATIONS IN EVERY WAY!! Our family has stayed in rental properties many, many times, both foreign and domestically and I will say that Patti's property is one of the very best! From the beginning, her communication was excellent and exceptionally helpful. She had many suggestions for services locally and sent us many recommendations (e.g., links for ski rental discounts, contact info for the best driver ever for transport to/from SLC)!! The condo itself was exactly as pictured - clean and well stocked. As others have mentioned, the location cannot be beat - you can walk to the slopes, a Starbucks, a great grocery store etc. Patti was also very accommodating and went out of her way to make sure that we enjoyed our stay. Will definitely stay again next time we visit Park City!! Incredible location at the base of Park City Mountain Resort top floor of the Snowcrest complex - 300 yards to 3 ski lifts at PCMR. Located on 15th street between Empire and Park. Walk to ski lifts, Main Street, shopping, groceries, theater, and much more! Free Shuttle bus stop is right across the street and will take you anywhere in Park City/Deer Valley. Check in time is after 4 pm, check out time is by 10 am. Rates are subject to change until confirmed and deposit is paid. tax/fees of 14.5% applied to all reservations. All reservations must pay a damage protection fee or a refundable $1000 security deposit. No cancellations for holidays or Sundance. Cancellations greater than 45 days prior to arrival receive full refund* minus $300 processing. *Sundance & holidays not included INTERNATIONAL CREDIT CARDS (non-USA) will incur an additional 1.5% processing fee after payment. This fee must be paid prior to receiving check in documents.